Let’s Speak Better English is a FREE Online English Language Course. It is aimed at ESL students who have already completed elementary and beginner levels of English. 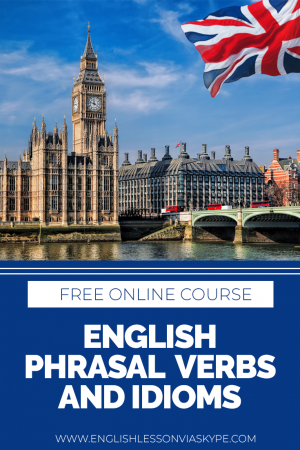 In this short English Learning Course you will learn 40 common Phrasal Verbs and English Funny Idioms in context. This course will help you improve not only your English speaking skills but also your lsitening skills. Don’t waste your time, enrol now! Following over 30 years working in business I changed my career path and reinvented myself as a Teacher, teaching English as a Foreign Language. I obtained my TEFL qualifications and have now been teaching Englsish over 8 years both online using Skype™ and in face-to-face lessons. I am successfully teaching to a very wide range of students across several continents. I specialise in Business English but happily teach people with any English learning needs. I have assisted many students to successfully pass a variety of English proficiency exams to gain employment with European or American organisations where English was the language of choice. How long will I have access to your free English course? Who should take English language course online? Anyone who would like to improve English speaking skills, learn new English expressions and speak better English. *This course is aimed at intermediate English learners. I don’t recommend this course to beginners. What will I be able to do after completing let's speak better english mini course?